When David Lynch self-released Eraserhead on DVD in 2000, he packaged the disc in an enormous box, making it impossible to file alongside the rest of one’s collection. Criterion’s new Blu-ray edition solves that problem, employing its standard, nearly square plastic box—but it does so at the expense of making Eraserhead seem like an ordinary movie, which it decidedly is not. Indeed, there’s arguably something fundamentally wrong about watching David Lynch’s magnificently nightmarish debut feature in the comfort (even the relative comfort) of home, no matter what the medium or circumstances. The film made its name on the midnight-movie circuit in the late 1970s, and it’s really best seen in that context; ideally, one would stumble into it by accident, at a theater located in the loneliest, most industrial part of town. Better still if the walk to the parking lot afterward is long and dark. Attempting to describe Eraserhead tends to be an exercise in futility, but it’s easiest to process as a young man’s worst fears about impending adulthood. The protagonist, Henry (Jack Nance), whose vertical shock of hair makes him look perpetually alarmed, has just had a child with his girlfriend, Mary (Charlotte Stewart), and many a parent who’s seen their newborn straight out of the womb, before it’s been cleaned up, will identify with Mary’s remark, “Mother, they’re still not sure it is a baby.” Swaddled in bandages and looking more reptilian than human, the baby, or whatever it is, cries piteously day and night, resisting all efforts to be fed or comforted; Mary is so stressed out that she abandons the family, leaving Henry to cope as best he can. Meanwhile, he experiences multiple bizarre visions, most notably a swollen-cheeked woman (Laurel Near) who lives in his radiator and occasionally emerges to sing show tunes. At one point, Henry’s head falls off and is carried by a young boy to a pencil factory, where it’s made into erasers; this explains the title, and thus is perhaps the film’s most readily comprehensible sequence. While it’s certainly possible to find metaphors in Eraserhead’s bizarre imagery, the film works on such an intensely visceral level that attempts to analyze it seem counterproductive. Can any words evoke the flesh-crawling queasiness of Henry’s visit to Mary’s parents’ house, in which he sits uncomfortably on the couch exchanging forced pleasantries with Mom while some ungodly squeaking/squelching noise threatens to drown out the dialogue? (In general, Eraserhead sports the most disturbing sound design in cinema history, courtesy of Lynch and Alan Splet.) Is it worse when the source of that sound is unknown (and unacknowledged by anyone in the room), or is it inexplicably worse when the source is revealed and it’s not the horror show conjured up by your imagination? Then there’s that infant… thing, which hits the precise amalgam of repulsion and vulnerability that’s capable of ripping one’s soul apart. Such masterful surrealism didn’t spring from nowhere, and one of the glories of Criterion’s new release of Eraserhead is that the supplements include five of Lynch’s early short films, including “The Alphabet” (1968) and “The Grandmother” (1970). (One had to buy these separately when ordering directly from Lynch; it got a bit pricey.) Also included in the package is “Eraserhead” Stories, a feature-length making-of documentary in which Lynch predictably ducks any and all questions about the film’s meaning or creative genesis, though he’s more than happy to recount his memories of the extended shoot (which took several years, on and off, during the entirety of which Nance, a real trooper, retained Henry’s ludicrous hairstyle). Honestly, this isn’t a film that benefits from a slew of behind-the-scenes info. It doesn’t even necessarily benefit from a Blu-ray release, gorgeous though this one looks. 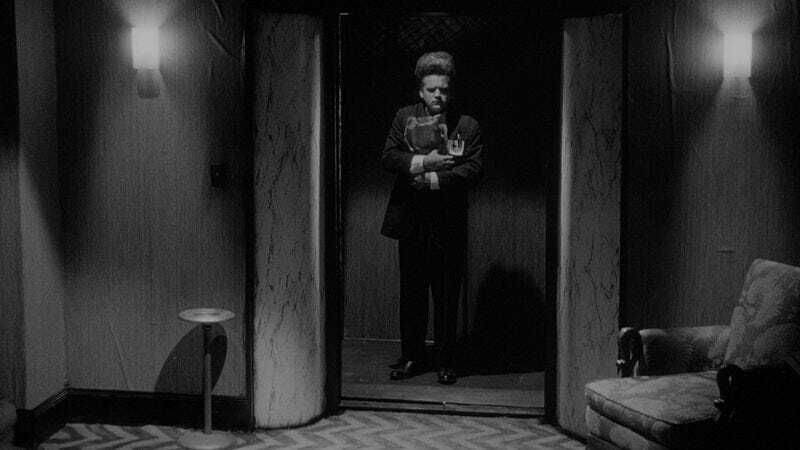 See Eraserhead once and it’ll lodge itself firmly in some dank recess of your brain and refuse to vacate. Owning a copy is just a technicality. Eraserhead is available on DVD and Blu-ray from Criterion.